English electronic duo AlunaGeorge, made up of Aluna Francis and George Reid, have collaborated with rappers Dreezy and Leikeli47 to release a music video for "Mean What I Mean." The song is from the group's next album, I Remember, due out on September 16, 2016. 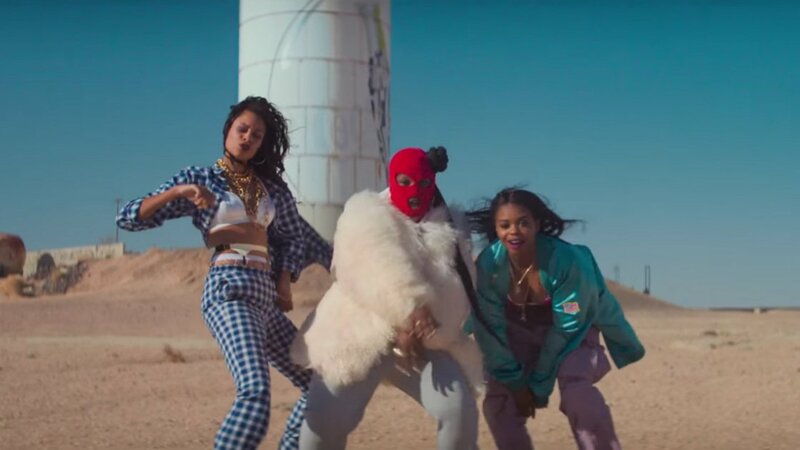 Watch above as Aluna Francis, Dreezy, Leikeli47, and a fierce female squad of backup dancers take over an abandoned waterpark in the middle of the desert. "Mean What I Mean" features the band's familiar electronic dance sound, but it is also the first time they have featured rap verses on one of their own songs. The closest they've come before was on Baauer's 2014 tune "One Touch" which also featured Rae Sremmurd. That's where I pull my lyrics from, at the moment, like if I went back into that situation, what would I have needed to handle it better... And that's where this song really comes from. And it was really nice because I got Dreezy and Leikeli, and they backed me with their really great verses. So I just feel like this is a full package of support, and celebrating the fact that we do know what we mean — people just need to listen it. AlunaGeorge have also shared "I'm in Control," "I Remember," and "My Blood" prior to the upcoming album. "Mean What I Mean" is out now and available to purchase on Amazon. For AlunaGeorge's latest music, news, and tour dates, check out their Zumic artist page.